Note: I received the following message last night from “Luke” (David Wilcock’s insider), who has been sharing information about the The Alliance, Secret Space Program (SSP), and the Sphere Beings who have recently entered our solar system. Thanks for stopping by again Luke, and sharing this new information with us! This is a lot of new information to assimilate and I’m sure many people will have questions. Luke has answered comments here before, so we’ll have to see if he stops by again to answer your questions in the comment section. There was a Major “Alliance Conference” at LOC/Lunar Operation Command (Same time frame as “Putin being reported as Missing”). SSP Alliance & “Defectors” from Secret Earth Governments & “Other SSP’s” were present for presentation by “Blue Avian” (Raw-Tear-Eir) & THE “INTRODUCTION”/FIRST VISIT by Second of four “Sphere Alliance” Beings (10+ Ft Tall, Golden/Brown Skin, Triangle/Teardr op Shaped Head etc.). The full description of the Being and the meeting reported thus far can be found at my site. There will be some very extensive the thorough reports on this information coming out in the very near future. I will be working closely with David Wilcock (As will some of his other SSP Contacts) to break down the current situation and provide information that has been approved for release through DW and Myself. IF YOU’RE LOOKING FOR A “SAVIOUR BEING” THAT IS NOT WHAT THEY ARE HERE TO DO. WE ARE GOING TO HAVE TO DO THAT OURSELVES ACCORDING TO THEIR “MESSAGE” AND PLAN RECENTLY COMMUNICATED! Hi GoodETsXG, with reguard to the DW information on the cloaked huge sphere ships in our solar system, is there a possibility (as i have read) that they are 4th dimensional and that follows that so are the Sphere Beings and therefore only visible to those with a conscious view into this dimension be they awake or asleep…If this is the case and as some also have hypothesized that the reason for the massive size of these ships is possibly due to the fact that they may be used for evacuation of Earth, does this mean that because they may be 4th dimensional that we “need” to be deceased (dead ) to be evacuated?Sorry if my logic does not follow thru and am by no means wishing to perpetuate fear, just interested in possible scenarios. They communicated directly to me that the Sphere Beings (Blue, Indigo & Violet Energy Orbs) and the 4 Allies (Including the “Avians”) are 6th, 7th, 8th and 9th D Beings. The “Spheres” can make themselves “visible” to our spectrum of sight at any time (All 3 known sizes of Spheres: Moon, Neptune & Jupiter Sized).They were “Observed” by the VARIOUS Secret Space Programs and Off World Allies when they first “Arrived” Fully “UnCloaked”. When they “Cloak” they are not detectable by “Wide Spectrum Imaging”, “Gravitational Displacement” or “Bending of Light”, “Temporal Energy Signatures” or any other “Known” technological means. Though some have been able to detect them just as they are decloaking indicating there is some sort of reintegration phase in the process. When they “Cloak” they seem to go completely “Out of Phase” physically and vibrationally with our Dimension or Reality. The one that was located and fired on had moved in fairly close between Earth and Mars and had show that it had stayed in its same position after decloaking and re-cloaking over time. They “Arrived” from 2 directions, From out of the SUN and From Outside the Sol System, Beyond the Oort Cloud. Once they entered the Solar system they then “Cloaked” at some point in our system and then “Parked” and went into an “Observation Mode” for an extended period of time. Many of them seemed to “Park” and “Cloak” around the “Gas Giant Planets” of our Sol System for a yet unknown reason. The others stayed in close orbit of the Sun before moving closer in toward the Earth more recently. I was told they had been waiting for the Energetic/Vibratory Changes to begin to occur in our sector of the Galaxy (Or “Star Cluster”) before they moved into a more “Active Operational Phase”. During this time period ALL of the SSP’s, Secret Earth Governments, Ancient Earth Breakaway Civilizations (Who many people STILL think are ET’s from another star system) and Each And Every “ET/ED Group” (Allied with various SSP’s/Secret Earth Governments etc…) also tried to “Reach Out” to communicate with the Sphere Beings via “Technical Communication and ED/Etheric Communication Methods” with “NO REPLY”. At one point some of the “Most Advanced” of the “Off World/ET/ED Custodian Groups” attempted to “Fire an Earth Based Weapon” at one of the Spheres. It had no effect on the Sphere other than to illuminate it (Bright RED) as the “Energy” was redirected to its point of origin and destroyed the facilities on Earth killing both Humans and “Non-Human’s” that were involved in this ill advised attack. There have been no further attempts to attack the Spheres since this occurred in Late December 2014. To this point the Sphere Beings have only communicated to me what I briefed DW on along with some other things they wan’t me to be taking part in, in the not too distant future. To be quite honest these are not things that I would have volunteered for or am very excited about doing. They have not communicated anything to me about “Evacuating” people or animals (Any life forms) off of the Earth (Yet anyway). 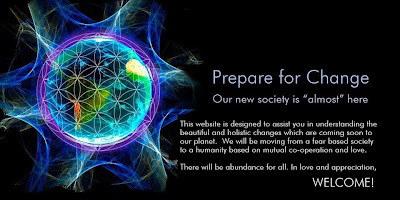 They have only stated they are here to help us “Prepare for future Events” and “To help ourselves”. A lot of people do not seem very happy about the “Helping us help ourselves” part of the communication as it seems that the majority of people are looking for saviors. These people cannot be totally blamed for this way of “Thinking/Feeling” since this has been genetically programmed into us by the “Custodian God’s” OR “Custodian ET’s” who have been tinkering with our Genetics for thousands of years and have programmed us to have a need to “Worship” or “Follow” something they perceive “Bigger than themselves”. Thank you for your continued well thought out questions. It is time that I bring together the information I have shared on a couple of Forums and with a couple well known Researchers about the relatively “Recent Arrival’s” of the “Sphere Beings” and their “Allies” to our Solar System. I have given some very detailed information to only ONE well known researcher that I have learned to trust and respect. I had caught a lot of negative feed back from some of the “Programs” because of the nature of the information and the fact that I was not “Cleared” (Or “Chosen”) by “Them” to release the information that I have been releasing for some time now (Although the “Blue Avians” & “Sphere Beings” seem to feel otherwise). The manner in which I released some information in a “Shot Gun” manner in the recent past offended a couple groups and I have been picked up and “Interviewed” for those actions. However some of these “Forces” have urged me to continue in a much more conservative manner beyond the scope of approval of any “Secret Earth Government” or “Other Organizations”… “Blessings”. I will be adding the information here in sequence over the next few days. The “Sphere Beings” have “4 Allies” of which only 1 has made them selves known. These are the “Blue Avians” (AKA Blue Bird Aliens). There are many who are being visited by “Blue, Indigo & Violet Orb Beings” who have seemed to just present themselves and disappear. They have actually been presenting themselves in order to communicate with those persons subconscious or “Higher Selves” and not directly to these people “Consciously”. These people have reported seeing these (Blue, Indigo & Violet) “Orb’s” appearing in their presence between the size of “Ping Pong Balls” and “Medicine Balls” and “Pulsing” then leaving their presence. This mistake by the “Elites” can be traced back to the information presented by “David Wilcock” recently at the LA “Conscious Life Expo” and the information of the MANY MOON BASES in existence. This is the topic we will delve into more deeply in coming days. I’m adding back some of the info I originally posted here then removed later that evening. There were a lot of things that are going to be abrasive to some currently held belief systems and established reality bubbles. Since this was obviously the case at the conference I figured the adage “As above so below” was an apt one here. The information being presented was what was presented to and through myself at the conference (Making me an unpopular “relay” of a message/communication in that case and from what I have seen online the same is true down here so far). I in many cases do not have any broader of an understanding quite yet of some of the information as I too have the same 3/4D mind that you do. I am a little more open to the experience being that I was one of the people that shared the actual experience. Between all of the speaking I did at this conference and the debriefing I did since being back my voice is almost gone and very scratchy (I have a very weak voice as it is). I do not profess to know everything or have all the answers, I don’t know all of life or deaths secrets and I am not a “Sage” or anyone special as was once again pushed home to me by these beings and also by seeing the approximately 70 other “Wide Eyed and Excited Regular Folks” that were present at the Conferences as well. Below is some of the info I had posted minus some that I felt the need to edit out until there is a complete and professionally put together Article producing all of the “Releasable Information” in a coherent way. – When I first arrived I was directed to the floor of a “Theatre” type conference room that holds about 300 people in very nice swivel chairs. I was told to stand in on spot in the area right in front of all of the people present with no instructions. I was feeling extremely exposed and nervous. I was standing there with my thumbs in my front pockets of my jeans while a couple of the people asked who I was and why I was wearing the cap I was (On my way out I happened to pick up a NASA cap from the rack that I grabbed my wind breaker from) and asked a few other uncomfortable questions. Then all of a sudden they got quiet and those who weren’t already seated did so looking forward. I turned and looked behind me and apparently the two beings standing behind me had just “Appeared” there. It was one of the Blue Avians I was familiar with and the New Being that had been promised to be “Introduced”, though there was no “Real Introduction”. The New Being was at least 10 feet tall (Taller than the Blue Avian in attendance), was very thin and “Lanky” with “Golden Brown” skin, “NO Uniform” on yet was not “Naked”. For being so tall it has only a 3 foot “Shoulder Breadth”, Long arms and legs with 3 long fingers and toes. It’s neck was a little on the long side and its “Head” looked large compared to the small shoulders. The head was shaped like an upside down Triangle (Pointing Down) with the corners “Rounded Off” in an almost “Tear Drop” shape with a somewhat “Flat Face. The mouth (Remained closed) was small but there was a crease at the corner of the mouth and a small rise where the lips would be (But no color difference). The eyes were completely oval, were “Powder Blue” with a dark “Iris” the shape of a “Diamond”. When it moved it did so in a VERY fluid like manner. I know this is a very short summary of what occurred and many details (Some extraordinary) have been left out for now (Though communicated to DW) until we can compile the complete list of what occurred and the data that was released making sure we release what was asked and keeping classified what was requested as well. It was thought best not to telegraph the “When” and “How’ this information will be presented at this early point. The mostly complete recount of the encounters will be presented from the moment I was picked up to the point I was “Dropped Off” back home will be presented in the near future. “They” again wanted to make sure that this info did not become held in a “cultish nature” or used in any controlling or egotistical ways. It was also interesting that there were approximately 70 normal human beings that were picked up and brought to these meetings who were absolutely blown away. Many of them were in their night time clothing with their hair sticking up and bare footed as though they had no warning of the meetings. There were also some people from a main stream political nature from around the world present, some that I recognized (None of which we would immediately recognize or associate with the “Establishment”.). The info of the “post conference meeting” where we were transported to the Sphere that was manipulated to allow us to be there physically will be spoken to the Researcher directly when we can talk securely and he will decide how to release the information and present it in the most digestible way. There was only a few “esoteric questions” those having to do with is there a “Soul Trap” awaiting us when we die, Were the Avians the “Ra” beings and a couple other small questions that were answered very interestingly… These “Alliance” group leaders were asking more “Brass Tacks” and operational questions. That is truly all I have to report at this time… Pardon errors as I am still incredibly exhausted and am still processing quite a lot of raw data and information in general about these experiences. The moment of a total solar eclipse is observed at Cape Tribulation in Queensland state, Australia, Wednesday, Nov. 14, 2012. A total solar eclipse is coming on Friday, between 8 a.m. and 10 a.m. GMT, and is sure to captivate people across Europe who will be able to see part of it. 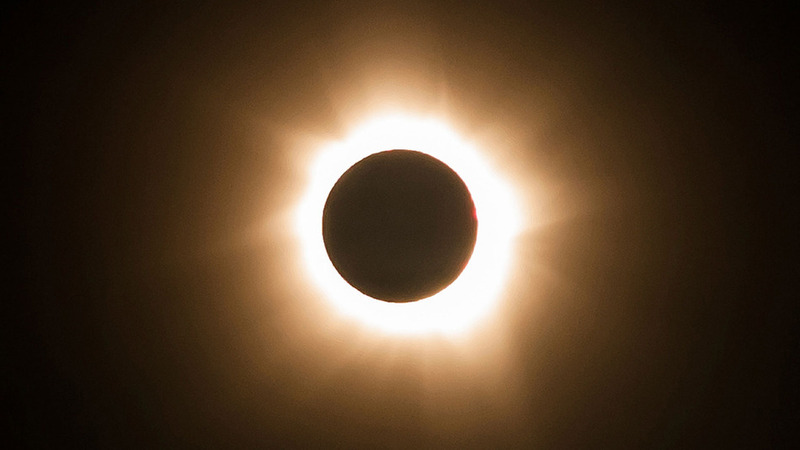 The rare event will be visible in a wide swath of the Northern Hemisphere, seen as a total eclipse in the Faroe Islands and Svalbard, and as a partial eclipse all the way from Scotland to northern Africa. The solar eclipse will occur when the sun, moon and Earth are aligned so that the moon’s shadow reaches the surface of the Earth. If you aren’t in the path of the eclipse, you can still watch online. Check back here for a livestream of the event on Friday, and follow Mashable on Twitter, Vine and Snapchat (“mashable”) for coverage from Travel Editor Jessica Plautz, who will be in the Faroe Islands, and editors Blathnaid Healy and Tim Chester in London. “An obvious partial eclipse will be visible from every country in Europe and the partial phase will also be seen from places as widely spread as Newfoundland, North Africa and northwestern Asia,” according to Dr John Mason, a scientist who writes for Astronomy Now. The exact time of the eclipse will vary depending on your location. 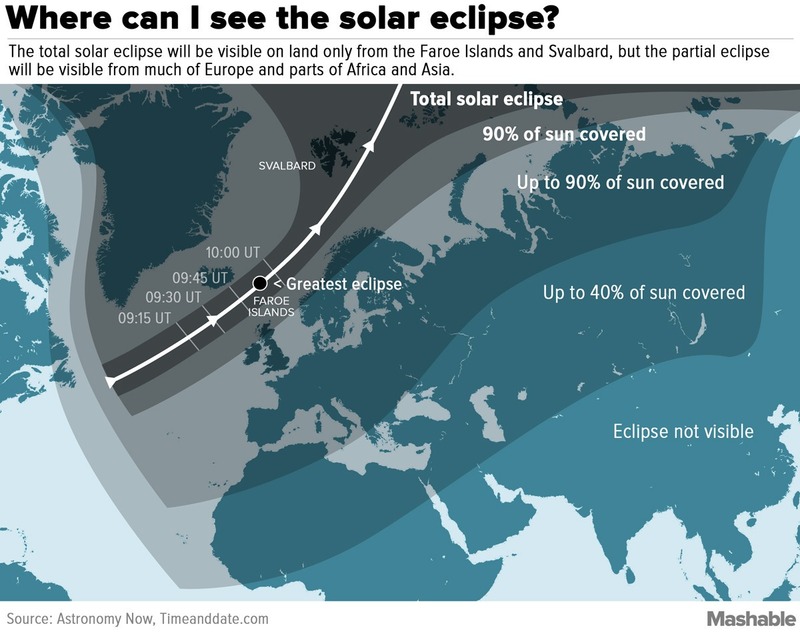 The only land areas that will see the total solar eclipse will be the Faroe Islands, which is an independent nation under Denmark, and Svalbard, a Norwegian archipelago in the Arctic Ocean. The last time a total solar eclipse was visible from Faroe was June 30, 1954. The nation even has a legend about four quarreling brothers who, when the sun disappeared one day, promised God they would make up and be kind to one another if he brought the sun back. (“He” did.) Mashable’s travel editor Jessica Plautz will be on the islands with hundreds of eclipse chasers who circle the globe to witness the event. 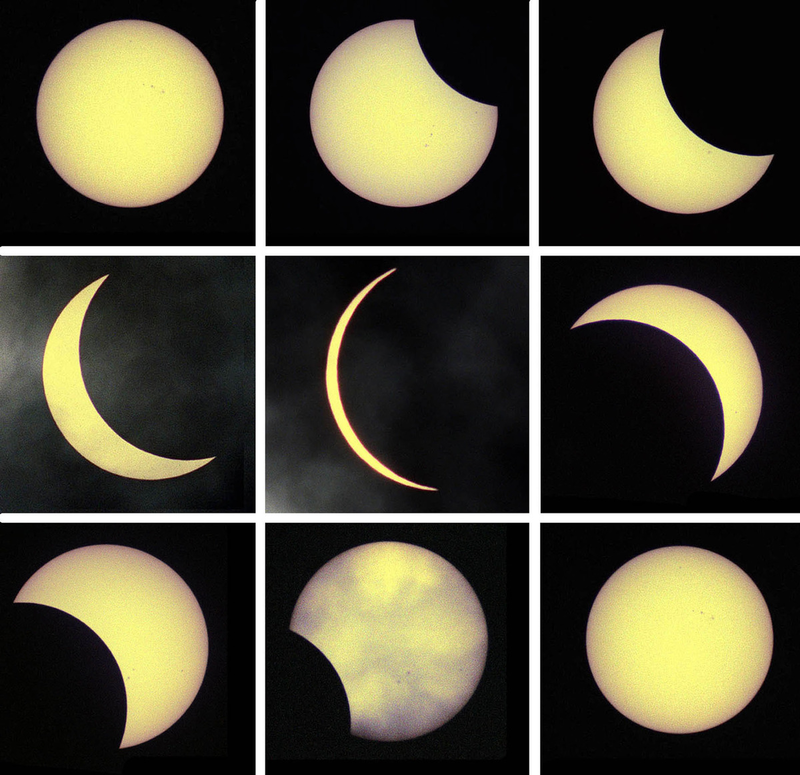 On Aug. 11, 1999, thousands of people across the UK donned pairs of silly-looking glasses or made pinhole projectors to look on in amazement as the sun, moon and Earth lined up for a total solar eclipse. Although there have been other partial solar eclipses visible from the UK in the intervening years, none have been quite as dramatic as the near-total eclipse happening Friday. In the far north and northwest parts of Scotland, the sun will be obscured more than 97%. In the south of England, the sun will be up to 85% obscured. The eclipse will last more than two hours, according to the British Astronomical Association. 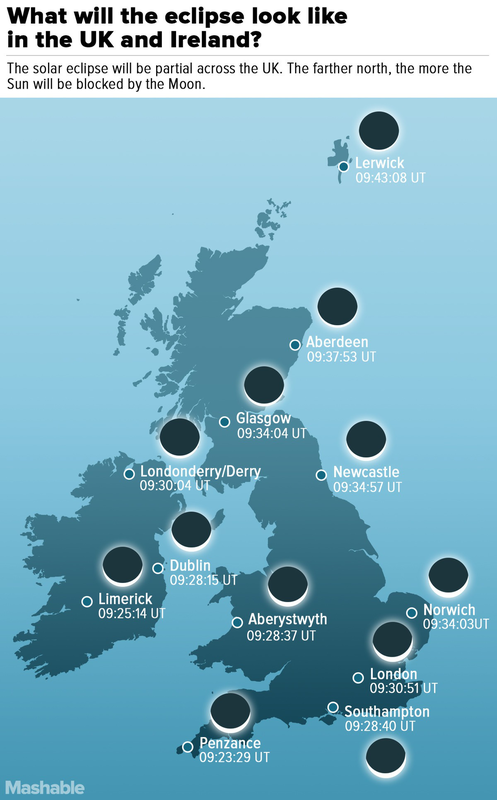 Timings vary depending where you are in the UK, but first contact, or the moment when the moon starts to block the sun, will start from 8:26 a.m. with maximum eclipse at 9:31 a.m. The whole event will be over by 10:41 a.m. As a general rule, the Royal Astronomical Society says the farther west or south you are the earlier the eclipse will begin. In Europe, as much as 90% of the sun will be obscured by the moon at the peak of the eclipse. While it will be an exciting viewing opportunity for many, it won’t be all fun and games. In Germany, the eclipse will test the country’s solar power infrastructure. Electric utilities will have to deal with rapid swings in energy production, as the sun is obscured between about 9:30 a.m. and noon local time. Northern regions of Africa and Asia will see as much as 40% of the sun covered. Do not, we repeat do not, look directly at the sun. Even when just a sliver of the sun is still visible it will be enough to burn the retina, and without proper eye protection, you are risking permanent damage to your eyes or even blindness. “No matter which recommended technique you choose, do not stare continuously at the sun. Take breaks and give your eyes a rest. And, remember, don’t use regular sunglasses — they don’t offer your eyes sufficient protection,” NASA says. 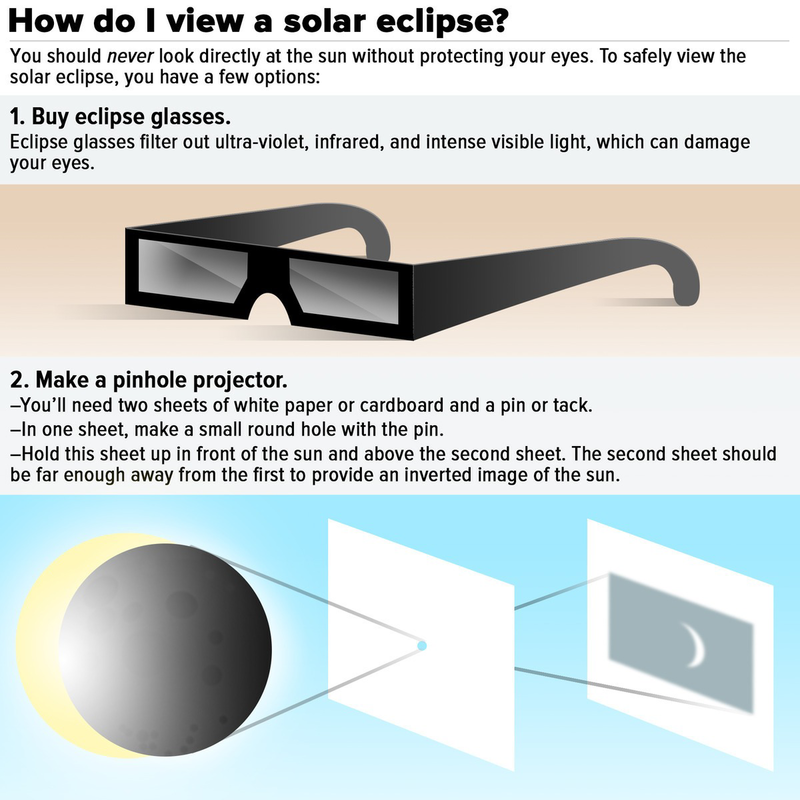 NASA says there are several ways to watch an eclipse safely and recommends projection, filters or telescopes fitted with solar filters. A pinhole projector is also an option. Although it doesn’t let you look directly at the sun — instead at a shadow of the eclipse — it will protect your eyes so you can see the next one. The next total solar eclipse will be on March 9, 2016, and will be visible from Sumatra, Borneo, Sulawesi and the Pacific, and partially visible in Australia. In 2017, a total eclipse will be visible across the contiguous United States.